BioLite knows a thing or two about emergency preparedness. The Brooklyn-based company was on the front lines during Hurricane Sandy, and its USB-charging CampStoves made national news for their role in helping residents keep communication lines open during the power outage. With the one-year anniversary of Hurricane Sandy approaching, BioLite just unveiled its emergency preparedness infographic & giveaway. 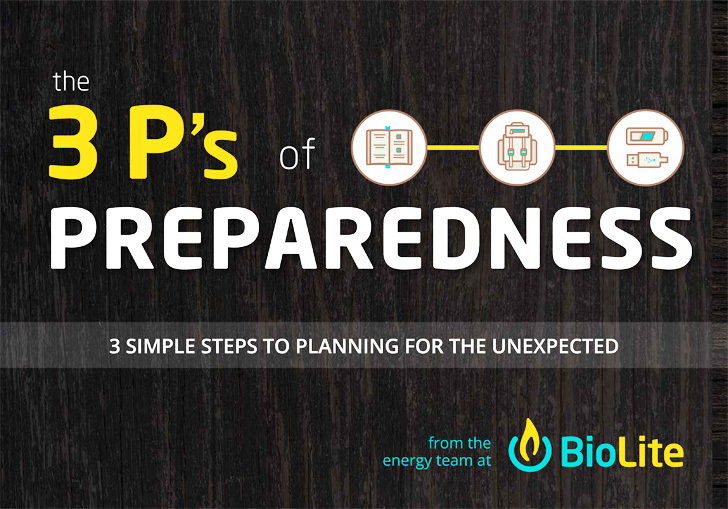 The BioLite 3 P’s of Preparedness infographic makes what can seem like an overwhelming task easy with its simple steps to plan, pack & power – check it out after the jump! BioLite knows a thing or two about emergency preparedness. The Brooklyn-based company was on the front lines during Hurricane Sandy, and its USB-charging CampStoves made national news for their role in helping residents keep communication lines open during the power outage. With the one-year anniversary of Hurricane Sandy approaching, BioLite just unveiled its emergency preparedness infographic & giveaway. The BioLite 3 P's of Preparedness infographic makes what can seem like an overwhelming task easy with its simple steps to plan, pack & power - check it out after the jump!